The Philadelphia Eagles went more than two months without a win, and even then they had to wait a few anxious minutes more to be sure they had ended the team's longest losing streak in 42 years. Nick Foles threw a 1-yard touchdown pass to Jeremy Maclin as time expired Sunday, but a 23-21 victory over the Tampa Bay Buccaneers remained in doubt until the instant replay official upheld the catch that the jubilant receiver made as he went to his knees in the side of the end zone. Rookie Doug Martin rushed for 128 yards and Josh Freeman shrugged off a slow start to throw for two second-half touchdowns to help Tampa Bay overcome its 10-point halftime deficit to go up 21-10 on Martin's 4-yard TD run midway through the fourth quarter. Martin put together the fourth 100-yard game of his career on 28 carries. Freeman threw TD passes of 1 yard to Mike Williams and 13 yards to Vincent Jackson, who finished with six receptions for 131 yards. The Bucs face Drew Brees and the Saints this weekend in a must win game. 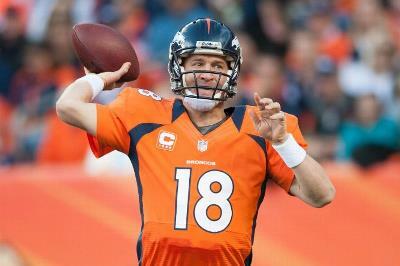 The Broncos defeated the Buccaneers 31-23 and wrapped up their second straight AFC West title. Late in the first quarter, Freeman found Mike Williams in single coverage down the middle for a 40-yard gain. Martin followed with a 7-yard run, then another for 5, then Freeman found Manning's old buddy in Indianapolis, Dallas Clark, for an 11-yard touchdown and a 10-7 lead. However, when the teams came out after halftime, Denver was a different team. Unrein caught a 1-yard touchdown pass from Manning to open the scoring, then got the hit on Tampa Bay quarterback Josh Freeman that forced a bad throw. It ended up in Miller's hands and moments later, the end zone for the score that turned the game into a runaway. The Broncos� defense held Tampa Bay rookie Doug Martin to 56 yards on 18 carries. The Buccaneers (6-6), surprising contenders under first-year coach Greg Schiano, fell a game behind Seattle for the second NFC wild-card spot and their loss clinched the NFC South for Atlanta. Next week the Buccaneers play the Eagles in Tampa. Go Bucs! Matt Ryan has led more late game-winning drives during the past five seasons than any other quarterback in the NFL. He has had five fourth-quarter rallies this year alone. So it was no surprise when Matty Ice did it again Sunday, throwing for 353 yards and overcoming two critical turnovers to stop Tampa Bay's four-game winning streak with a 24-23 victory. The Buccaneers� winning streak, which helped the Bucs climb back into playoff contention following a slow start, ended when Josh Freeman's desperation pass fell incomplete in the end zone on the final play. This loss stopped the Bucs, who've won five or seven following a 1/3 start, from tightening the NFC South standings. Doug Martin scored on a pair of 1-yard runs for the Bucs; however, the rookie who began the day leading the NFL in total yards from scrimmage was limited to 50 yards rushing on 21 carries. 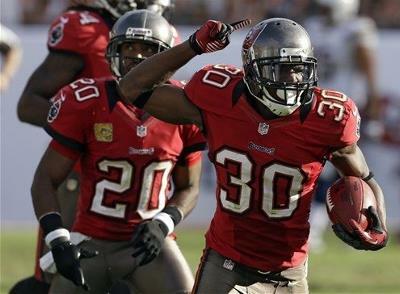 Freeman finished 19 of 30 for 256 yards, and Vincent Jackson had five catches for 96 yards. The difference of the game was when Atlanta held the Bucs to field goals after each of Ryan's turnovers, once after Tampa Bay had 1st-and-goal at the Atlanta 3. The road doesn�t get any easier for the Bucs next week as they travel to Denver to take on Payton Manning and the Broncos. You had to see the end of this game to believe it! Josh Freeman threw a 15-yard touchdown pass to Dallas Clark in overtime giving the Buccaneers a 27-21 comeback win over the Panthers on Sunday. The Bucs came in as one of the hottest teams in the league, having scored an average of 35.6 points per game during the past five games. Freeman had thrown 13 touchdown passes and only one interception in those games. But after Tampa Bay jumped to a 10-0 lead, the Panthers' defense shut them down for most of the remainder of the three quarters, forcing three turnovers. With 10 minutes left in the game, the Buccaneers turned it on scoring 17 points to rally for one of their most improbable victories ever. Dallas Clark was the hero in overtime catching a 15-yard touchdown pass from Josh Freeman leaving the Panther fans in total shock and disbelief. After the game, Clark was talking about his gaming winning catch, "You've got to love it when the linebacker swears as you're heading up field," Clark said with a laugh. Things will not get any easier for the Buccaneers as they return home to take on the Atlanta Falcons next weekend. Tampa Bay's suddenly potent offense got some help from unlikely sources in rolling to another high-scoring victory over the San Diego Chargers on Sunday. The Buccaneers had two touchdowns on offense and one each on defense and special teams to beat the Chargers 34-24 for their third straight win. The Bucs beat the Chargers for only the second time in 10 meetings all-time. Josh Freeman was 14 of 20 passes for 210 yards and threw a pair of touchdown passes as the surging Bucs scored on a blocked punt and a 83-yard interception return for a touchdown. Freeman has now thrown for 13 TDs with just one interception in his past five games, helping the Bucs win four times and get over the .500 mark following a 1-3 start. Vincent Jackson, the former Chargers' receiver, had five receptions for 59 yards in his first game against his old team. After 2 big breakout games, rookie running back Doug Martin came back down to earth with 19 carries for 68 yards and a 42-yard reception. This weekend the Bucs take the show on the road to face the Carolina Panthers for the second time this season. Doug Martin never had a homecoming like this during his stellar college career at Boise State. 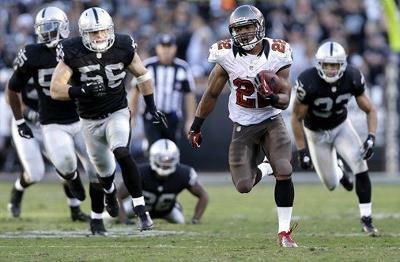 Martin rushed for a franchise-record 251 yards and four touchdowns to help the Buccaneers beat the Raiders 42-32 on Sunday. Martin, who was born in Oakland and went to high school in nearby Stockton, had a memorable return home for the Buccaneers by scoring on runs of 1, 45, 67 and 70 yards in front of more than 60 friends and family members. Martin was the 31st pick in April's draft out of Boise State, becoming the first back since at least 1940 to score on three TD runs of at least 45 yards in one game. Josh Freeman threw for 247 yards and two touchdowns as the Buccaneers scored at least 28 points for a franchise-record fourth straight game and reached .500 at the midpoint of Schiano's first season to match last season's win total. The Buccaneers are averaging 477 yards and 36 points per game over the past four contests. If the Buccaneers can maintain this type of production, a playoff berth may not be out of the question. Most of the nation gave the Buccaneers little to no chance when they traveled to Minnesota to take on the Vikings last Thursday night. The biggest story of the game had to be rookie running back Doug Martin who racked up 214 total yards, including a career-high 135 rushing and two touchdowns. The Buccaneers romped to a 36-17 victory to hand the Vikings their first home loss this season as the nation got a better look at Doug Martin and a much improved Buccaneer offense. Josh Freeman went 19 for 36 for 262 yards and, most importantly, no turnovers. Mike Williams caught a touchdown and had 68 yards on six receptions, and the Buccaneers held the ball for nearly 38 of the 60 minutes. The Buccaneers defense also played well with an energized pass rush that had three sacks and flustered Christian Ponder with a heavy dose of blitzes. Ponder finished 19 for 35 for 251 yards, one touchdown and a late interception at the end of a desperation drive. The Buccaneers won only two of new coach Greg Schiano's first six games, but all four of their losses were by seven points or less. So this was their chance to finally enjoy a comfortable victory, but they wont enjoy this one for very long as they start to prepare for a long road trip to Oakland to play the Raiders a week from this Sunday. 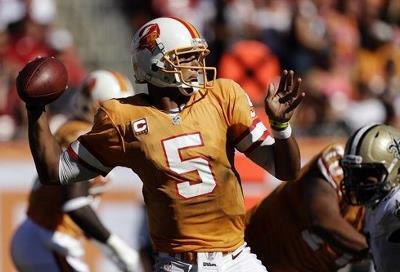 Josh Freeman threw for a career-high 420 yards and three touchdowns as the Buccaneers lost another close one 35 - 28. Vincent Jackson had seven receptions for 216 yards, but failed to score on a 95-yard play in which safety Malcolm Jenkins ran him down to make the tackle at the Tampa Bay 1. LeGarrette Blount was stopped for no gain on three straight runs, then Freeman lost 4 yards on a quarterback keeper on fourth down. This proved to be the difference in the game. Drew Brees finished off the Buccaneers from there as he marched the Saints down the field on what would prove to be the winning drive. Brees extended his NFL record for consecutive games with at least one TD pass to 49, while leading long scoring drives on four straight possessions to turn a 14-point deficit into a 28-21 halftime lead. The Buccaneers have to put this loss behind them fast as they get ready to play the Minnesota Vikings this Thursday Night. Ronde Barber continues to thrill the Buccaneer fans this Sunday by making an interception and returning it 78-yards for a touchdown. That was Barber's eighth career interception return for a TD. The 37 year old and 5 time Pro Bowl selection has always found a way to make big plays and this weekend was no different. The Buccaneer defense limited the NFL's leading rusher, Jamaal Charles, to just 40 yards on 12 attempts. Josh Freeman also had a good game, throwing for a season high 328 yards and 3 touchdowns on the way to a 38 - 10 rout of the Kansas City Chiefs. Freeman's inconsistency this year has been an issue during a slow start by Tampa Bay; however, the fourth-year pro is developing a touch on deep passes that's sparked a sputtering offense over the past two games. Mike Williams scored on a 62-yard touchdown pass in the first quarter and Vincent Jackson had touchdown receptions of 19 and 17 yards in the second half. This latest victory coming off a bye week ended a three-game skid. The Buccaneers will play their second 1 win team in a row this weekend when the Saints come calling. 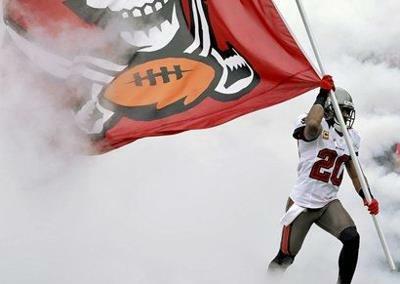 We will need some more magic from Ronde Barber and the Bucs defense if we hope to shipwreck the Saints. The Buccaneers' offense finally showed some life in this game. 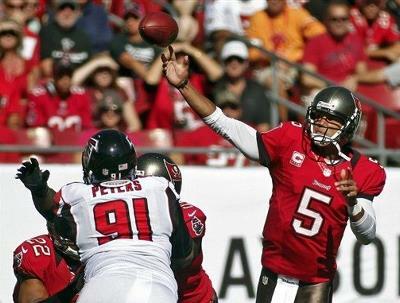 Josh Freeman threw for 299 yards and had a particularly good second half to put the Bucs back in the game. Vincent Jackson accounted for six catches for 100 yards. LeGarrette Blount was more involved with six carries and had 17 yards and a touchdown. Doug Martin had eight carries for 33 yards. Tampa Bay's defense has been the bright spot through most of the first four games. 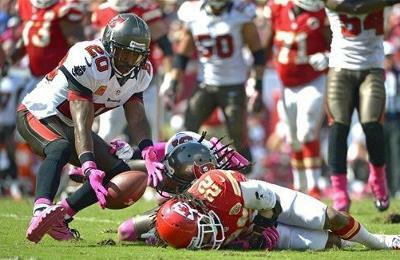 But the defense let the Bucs down when it mattered most on Sunday. After Connor Barth gave the Bucs a one point lead with under two minutes left, Robert Griffin III and the Washington offense were able to march straight down the field for the game-winning field goal. Despite the 24-22 loss to the Redskins the Bucs put out another solid effort, but all it added up to was their third straight loss. Remember it took the Bucs half a season to start grasping things back when Tony Dungy took over and he wound up leading the team through its longest period of consistent success. At least these Bucs are looking better than the Bucs in the first half of Dungy's first season. Next week the Bucs have a bye week and have 2 weeks to prepare for the Kansas City Chiefs. 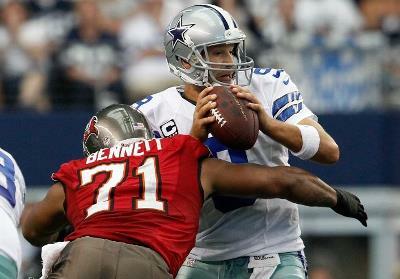 Despite a great game by the Buccaneer defense, poor play calling on offense contributed to a 16 -10 loss to the Cowboys. Josh Freeman was terrible, staring down receivers, holding on to the ball too long and not completing enough passes to sustain offensive drives. 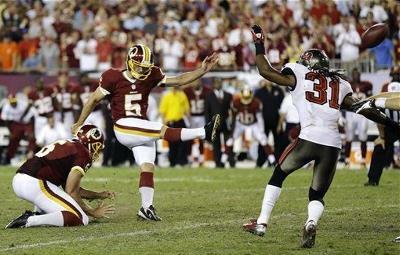 The Buccaneers generated only 166 yards of total offense and completed just 3-of-15 third down conversion attempts. Freeman completed 10-of-28 passes for 110 yards with one touchdown, one interception and was sacked twice, fumbling on both of those sacks. It was one of the worst performances of his career. The Tampa Bay Buccaneers have the NFL's worst offense. The Bucs are No. 32 in total offense (No. 21 in rushing and No. 30 in passing). If that wasn't enough, during Monday's press conference, Bucs head coach Greg Schiano delivered the news that DE Adrian Clayborn will require surgery and be out the remainder of the season. The Bucs are hoping that some home cooking is what is needed as they return home next weekend as the upstart Washing Redskins and RG3 come calling. Good Luck Boys! The Buccaneers were unable to close out the game against the Giants as quarterback Eli Manning shocked Tampa Bay by leading his team to 25 fourth quarter points to come back for a thrilling, 41-34 victory. Manning completed 31-of-51 passes for 510 yards and three touchdowns to rally the Giants from a 27-13 third quarter deficit to win the Giants� first game of the season. The Bucs had three second quarter interceptions, including one that was returned for a 60-yard touchdown by cornerback Eric Wright. The Bucs however, were unable to record a sack during the game. Despite having a double-digit lead in the second half, the Bucs offense became very conservative and Tampa Bay�s defense gambled too much in the second half. The Bucs offense accounted for only 183 yards in the second half compared to 327 yards gained by the Giants. 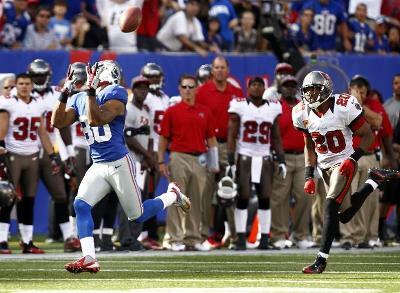 The Giants had 604 yards on the day compared to the Bucs total of 307 yards. On a positive note, wide receiver Vincent Jackson had five catches for 128 yards, including a 29-yard touchdown, and Mike Williams had three catches for 59 yards, including a 41-yard touchdown to tie the game at 34-34 late in the fourth quarter. 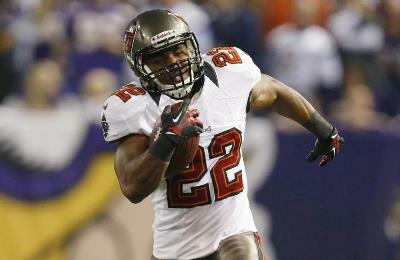 Rookie running back Doug Martin had 66 yards on 20 carries and his first NFL touchdown, on an 8-yard run. The Bucs need to put this bad loss behind them as they prepare to travel to Dallas and play the Cowboys next Sunday. How about them Cowboys! 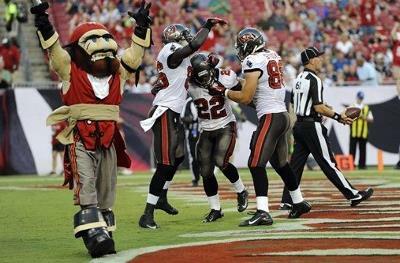 The Buccaneers beat the New England Patriots, 30-28, Friday night at Raymond James Stadium. The NFL's 2012 regular season is now just two weeks away. From the look of things on Friday night, the Tampa Bay Buccaneers are ready. After suffering a severe knee injury against the Patriots, Davin Joseph was placed on injured reserve and will miss the entire 2012 season according to head coach Greg Schiano. Joseph will likely be replaced by third year player Ted Larsen, who has spent the majority of the past month as Jeremy Zuttah's back up at center. On the positive side, the Buccaneers gave the start to rookie RB Doug Martin, and he used it to his advantage and has emerged as the Buccaneers incumbent starter. The best news so far during this preseason is that the first-string defense has forced nine three-and-outs in 12 possessions over the past two games as the team's young and fast defenders have begun to feel comfortable in Greg Schiano's scheme. Next week we travel to Washington D.C. to finish out the preseason with the Redskins.